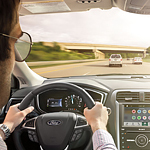 The Ford Co-Pilot360: The Most Innovative Driver-Assist Package Available | Karl Flammer Ford Inc.
With the Ford Co-Pilot, you get a Blind Spot Information System. This system keeps you informed when vehicles enter your blind spot zones. When a vehicle is detected, this system will provide you with a visual alert on the side-mirror of your Ford model. Pre-Collision Assist with Pedestrian Detection is also offered with this package. This feature monitors for potential frontal collisions. If a vehicle or pedestrian is detected in your path, this system will alert you with a visual and audible warning. In addition, this system can apply automatic emergency braking if needed to help you avoid impact.